A tugboat (tug) is a boat that maneuvers vessels by pushing or towing them. Tugs move vessels that either should not move themselves, such as ships in a crowded harbor or a narrow canal, or those that cannot move by themselves, such as barges, disabled ships, or oil platforms. Tugboats are powerful for their size and strongly built, and some are ocean-going. Some tugboats serve as icebreakers or salvage boats. Early tugboats had steam engines, but today have diesel engines. Many tugboats have firefighting monitors, allowing them to assist in firefighting, especially in harbors. The standard seagoing tugboat with model bow that tows its "payload" on a hawser. The "notch tug" which can be secured in a notch at the stern of a specially designed barge, effectively making the combination a ship. This configuration is dangerous to use with a barge which is "in ballast" (no cargo) or in a head or following sea. Therefore, the "notch tugs" are usually built with a towing winch. With this configuration, the barge being pushed might approach the size of a small ship, the interaction of the water flow allows a higher speed with a minimal increase in power required or fuel consumption. The "integral unit," "integrated tug and barge," or "ITB," comprises specially designed vessels that lock together in such a rigid and strong method as to be certified as such by authorities (classification societies) such as the American Bureau of Shipping, Lloyd's Register of Shipping, Indian Register of Shipping, Det Norske Veritas or several others. These units stay combined under virtually any sea conditions and the "tugs" usually have poor sea keeping designs for navigation without their "barges" attached. Vessels in this category are legally considered to be ships rather than tugboats and barges must be staffed accordingly. These vessels must show navigation lights compliant with those required of ships rather than those required of tugboats and vessels under tow. Articulated tug and barge units also utilize mechanical means to connect to their barges. ATB's generally utilize Intercon and Bludworth connection systems. Other available systems include Articouple, Hydraconn and Beacon Jak. 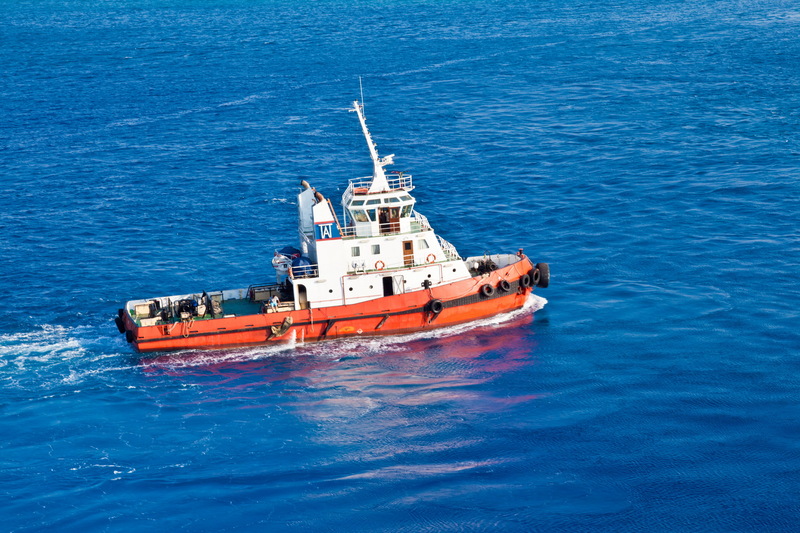 ATB's are generally staffed as a large tugboat, with between seven to nine crew members. The typical American ATB operating on the east coast, per custom, displays navigational lights of a towing vessel pushing ahead, as described in the '72 COLREGS. Historically tugboats were the first seagoing vessels with steam propulsion, providing freedom from the restraint of the wind. As such, they were employed in harbors to assist ships in docking and departure. River tugs River tugs are also referred to as towboats or pushboats. Their hull designs would make open ocean operation dangerous. River tugs usually do not have any significant hawser or winch. Their hulls feature a flat front or bow to line up with the rectangular stern of the barge.